A native of the Pacific Northwest, dramatic soprano Erin G. McCarthy is a dynamic performer who brings a steely, soaring voice and an "elegant, sparkling" (Willamette Week 2003) presence to the concert, opera, and recital stage. To learn more about Erin's experience as a professional singer, read her Bio. You can also listen to audio clips, see photos, and check out press. Erin is an accomplished instructor with many years of experience helping singers achieve vocal excellence. Her students enjoy a teacher with practical knowledge, a supportive and enthusiastic demeanor, and an environment of support and achievement. 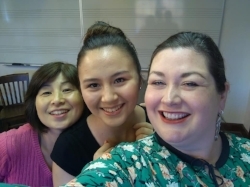 Read more about the Erin G. McCarthy Vocal Studio to see how you can become a student! A passionate horsewoman, Erin has been doing dressage for decades and has been an active member of the Oregon Dressage Society for 20 years. She uses her singer's knowledge about breathing to help riders develop relaxation and effectiveness in the saddle. Through her methods, riders can learn breathing techniques that release unwanted tension, improve clarity of aids, and achieve greater connection with their horse.